When you give a presentation you created in Snow Leopard’s Keynote application, you may not always want to print handouts. However, if you’re presenting a lengthy slideshow with plenty of information that you’d like your audience to remember, nothing beats handouts that include scaled-down images of your slides (and, optionally, your presenter’s notes). You can also use Keynote to create an electronic PDF-format document instead of a printed handout, which your audience members can download from your Web site. Within Keynote, click File and choose Print. Keynote displays the Print sheet. Choose a print option for your Keynote notes and slides. To print each slide on a separate page at full size, click Individual Slides. 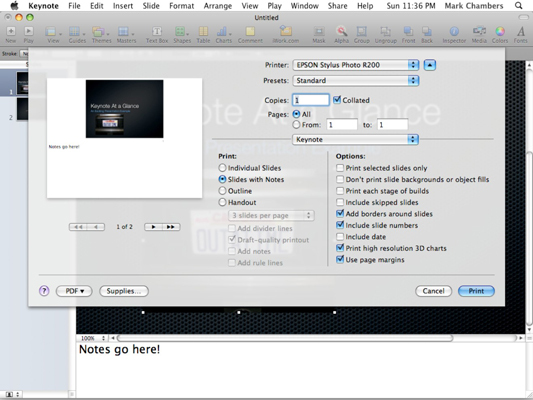 To print each slide on a separate page with the presenter’s notes for that slide, click Slides with Notes. To print the contents of your Slides list in Outline view, click Outline. To print a handout with multiple slides per page (and, optionally, with presenter’s notes), click Handout. Click the Slides per Page pop-up menu to specify the number of slides that Keynote should print on each page. Select the pages to print. To print the entire document, select All. To print a range of selected slides, select the From radio button and enter the starting and ending pages. Select or deselect specific options from the Options column. You can include elements such as the date, borders around each slide, and the slide number as part of each page of the hardcopy. Click the Print button to send the job to your printer.